In 1912, city officials and representatives with the Degnon Contracting Company were preparing to excavate for the planned BMT Broadway subway line. Holding lanterns above their heads, they climbed into a dark ventilation shaft in City Hall Park and proceeded to find themselves in a well built, but slightly dilapidated tube. They quickly discovered a tunneling shield as well as the rotted remains of an old wooden train within the vicinity. What was Alfred Ely Beach’s forgotten pneumatic subway tunnel? By the mid-1800s, public transportation in Manhattan was a nightmare. Streetcars and carriages raced down crowded streets at reckless speeds. Accidents were a way of life. So, after London opened its first subway in 1863, New Yorkers started clamoring for one too. At the time, Boss Tweed was the major figure in New York politics. He ruled Manhattan like a king and collected kickbacks from all sorts of businesses, including the streetcars. Tweed didn’t want to give up the income, at least not without a hefty replacement. Meanwhile, a man named Alfred Ely Beach had become intrigued at the idea of building his own subway system under New York’s streets. Beach was the owner of the Scientific American magazine and had invented a typewriter for blind people. He was also fascinated by pneumatics, a system that used compressed air or vacuums to propel cylindrical containers through close-fitting tubes. Although the technology was usually used to send mail from one place to another, Beach thought it could move people as well. At the 1867 American Institute Exhibition, he unveiled a prototype of a pneumatic subway system. His tunnel was 100 feet long and made of plywood. Using a steam-powered fan, Beach proceed to transport a 10-person subway car from one end of the tunnel to the other and back again. Beach believed he had the answer to the city’s transportation problems. But since he knew Boss Tweed wouldn’t give him a chance to build his pneumatic subway, he decided to go over Tweed’s head and appeal to the public. So, he got a permit to build two pneumatic mail tubes under Broadway. After it was approved, he amended the bill to allow for a much larger tube which would supposedly hold the smaller ones. In 1868, Beach and a team of workers entered the basement of Devlin’s Clothing Store at the corner of Broadway and Warren Streets. Using a tunneling shield and working only at night, they began to cut a hole through the earth. Despite making every attempt to keep the project a secret, people began to wonder what was going on. But Beach refused entrance to curious onlookers. In just 58 days, Beach’s demonstration pneumatic subway tunnel was complete. It was 8 or 9 feet in diameter and measured 312 feet long. One entered the system by going through Devlin’s and proceeding into a lavish waiting room that held elaborate chandeliers, paintings, a grand piano, and even a fountain full of fish. The subway car – a cylindrical wooden vehicle that held enough seating for twenty-two people – was equally opulent. On February 26, 1870, Alfred Ely Beach finally opened the doors to his magnificent pneumatic subway tunnel. People lined up around the block just to get a glimpse of it. The New York Herald called it Aladdin’s Cave, and marveled at how people could miraculously transport from one end of the tunnel to the other. The price of admission was $0.25 and all proceeds were donated to the Union Home and School for Soldiers’ and Sailors’ Orphans. The public took over 400,000 rides during the first year. After entering the car, people would ride to the end of the short tunnel via air pressure from a 48-ton fan. Then the fan reversed, sucking the car back to the start of the pneumatic subway tunnel. The Pneumatic Subway: Lost…and Rediscovered? The tunnel was a massive hit and Tweed saw an opportunity. He joined forces with Beach and together, the two men lobbied the legislature for permission to expand the system. However, the proposal stalled in the legislature, partly due to concerns from the Astors and other wealthy families that pneumatic subway tunnels would undermine their properties. When everything was said and done, the system was never built, for reasons we’ll explore tomorrow. Alfred Ely Beach and his tunnel play very important roles in Chaos. Initially, I wanted to resurrect his demonstration tunnel but that proved impossible. The tunnel was indeed destroyed back in 1912. There’s a very slim chance that some remnants of the waiting room might still exist. However, this seems pretty unlikely. Cy Reed soon figures out the answer to his question…and in the process, uncovers a mystery that’s rested quietly beneath New York’s streets for over a century. 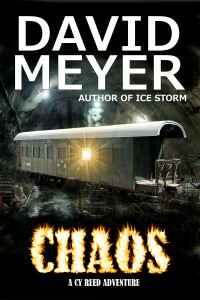 You can read more about his thrilling adventure by getting a copy of the Chaos paperback from any of the links above. That’s all for now. Tomorrow, we’re going to take a closer look at Alfred Ely Beach and the mystery that underlies a good portion of Chaos. Stop by tomorrow to check it out…I hope to see you then! 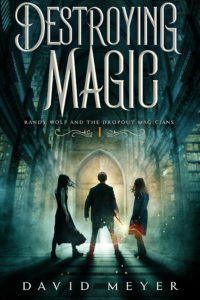 October 17: Chaos has Arrived! October 25: The Great Train Robbery? October 26: Is Treasure Hunting Immoral? October 27: What was Operation Paperclip? October 28: Nazi Treasure & ODESSA? October 29: Do the Mole People Exist? October 31: FDR’s Lost Subway Car? November 1: Do Alligators Live in New York City Sewers? November 2: The Mysterious Minamata Disease? November 3: Die Glocke & Nazi Wonder Weapons? November 4: Buildering: The Art of Climbing…Skyscrapers? November 5: The Strange Case of Red Mercury? November 6: The Island of Stability? November 7: The Nazi Atomic Bomb? November 8: The Nth Country Experiment? November 9: Why did America really bomb Hiroshima? November 10: New York’s Forgotten Subway Tunnel? November 11: Alfred Ely Beach’s Last Secret? November 12: The Strange Science of Superconductors? Posted in Cy Reed, David Meyer, Mysteries of History, Strange Stories and tagged Chaos, Cy Reed, David Meyer, Fiction, Mysteries of History, Urban Exploration.